As a kid in the early 1980s, I read pretty much every comic Marvel produced, so that included Power Man and Iron Fist. That series took two characters who couldn’t sustain sales on their own and combined them in hopes of greater success. Fast-forward 35 years or so and TV finds the two heroes separated again, as both inspired their own series. Here I’ll address 2016’s Luke Cage, a show about the character known as “Power Man” in the old comics. 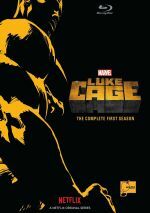 This four-disc Blu-ray set provides all 13 episodes from Season One of Luke Cage. The plot synopses come from IMDB. Pilot episodes tend to focus on introductions and exposition, and that largely becomes the case with “Truth”, though it doesn’t dig into story/character backgrounds in depth. As a series launcher, it proves reasonably efficient, but I can’t claim it makes me all that excited to see where the show goes. Hopefully Cage will get more involving from here. 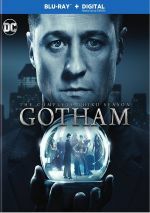 Like “Truth”, “Code” largely emphasizes exposition and early character development, as it appears to push the series toward a main narrative. Also like “Truth”, the episode leaves me a little cold, but I think it does enough to move the season forward that it gives me hope of greater drama in the future. From the very early moments of “Truth”, it seemed inevitable that Luke and Cottonmouth would become primary enemies, so this aspect of “Weight” comes as no surprise. Other aspects of “Weight” seem pretty predictable as well. Some action beats enliven the episode but the narrative remains fairly tepid. To date, Season One has acted as an “origin story” in that it shows how Luke became a do-gooding vigilante, but it left us in the dark about the way he acquired his powers. Though we get some story material in “present day”, most of “Arena” remains in the past and points toward Luke’s development. While not the most dynamic episode, it manages some interesting details and gives us a bit better understanding of our lead. Most of the prior episodes felt like little more than basic exposition, so I’m happy to see “Rep” move along the action and drama better. It seems like we’ve finally gotten past the basics and can now explore topics in a more satisfying manner. Throw in an intriguing new character played by Rosario Dawson and “Rep” puts the series on the upward slope. As my notes indicate, Cage didn’t exactly enchant me for its first few shows, but once the series got Luke’s backstory out of the way, it’s come to life. “Suckas” continues this ascension and delivers a dramatic episode with good development and momentum. Character elements come to the fore here, and we get flashbacks to Cottonmouth’s youth that finally let us meet Mama Mabel (Latanya Richardson Jackson). These elements add depth to the series along with the usual action, so “Manifest” propels the season in a positive manner. “Manifest” ended with a major development, so “Spot” uses much of its time to proceed after that event. Though this leaves “Spot” as more expositional than the last few shows, it still manages to push things ahead well. Like “Manifest”, “DWYCK” seems more like a “narrative-builder” than anything else. It lacks much substantial drama of its own, but it accelerates some story/character points in a fairly satisfying manner. After a couple of fairly expository episodes, “Personal” ups the ante well. It digs into Luke’s past and points toward the future via intensified concerns with the cops and Mariah. Expect a solid show. After the broad drama of “Personal”, “Mine” goes with a tighter focus, as it largely concentrates on one location and theme. This gives the episode a nice sense of tension along with a few useful character tidbits. With little time left in the season, “Chaos” manages to up the ante pretty well. Toss in a little much-needed comedy and a fun guest spot from a famous musician to make “Chaos” a strong way to push toward the season finale. After an action-packed opening, much of “Steez” wraps up elements from the season’s storylines and character elements. This fills more of the episode than I’d prefer, but “Steez” still manages to encapsulate matters well enough, and it finishes the year on a positive note. Luke Cage appears in an aspect ratio of approximately 1.78:1 on this Blu-ray Disc. As expected, the shows looked pretty good. Overall sharpness worked well, though interiors and dark shots could seem a bit on the soft side. Still, they usually displayed nice delineation. No issues with shimmering or jaggies emerged, and the episodes also lacked edge haloes or source defects. In terms of palette, Cage went with a mix of teal, amber, green and red. The hues looked well-depicted within those choices. Blacks appeared dark and tight, while shadows could be a bit dense. Though low-light elements offered fairly good delineation, they could be a little thicker than I’d like. Still, the shows largely seemed appealing. I also liked the DTS-HD MA 5.1 soundtrack of Cage. For the most part, the mixes hewed toward the front, where we got nice stereo music and consistently good sense of environment. With a lot of action on display, the rear speakers added a fair amount of information as well. Gunfire, vehicles, and the like all fleshed out the spectrum in a reasonably satisfying manner. Only one extra appears here: a 22-minute, 43-second featurette called Offstage at Harlem’s Paradise. It presents a roundtable chat among actors Mike Colter, Alfre Woodard, Simone Missick and Theo Rossi along with additional comments from executive producers Charles Murray and Jeph Loeb, show creator/executive producer Cheo Hodari Coker, and producer/writer Aida Croal. “Offstage” looks at casting and characters, sets and locations, music, and general thoughts. The reel offers a decent but overly fluffy overview. After a slow start, Season One of Luke Cage becomes a pretty good superhero series. It gives us a grittier than usual take on the genre and offers fairly solid material. The Blu-rays offer generally positive picture and audio along with minor supplements. Though it takes time to get there, Cage ultimately succeeds.